Work is piling up along. The sink is filled with dishes along with full laundry baskets and children who want me to play with them. It has been a recent mission of mine to give my office/ guest room a face lift. I want it to be a place for inspiration and motivation as I work on my designs. So random nerd items are making their appearance. 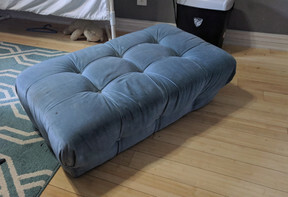 This weeks item is an amazing foot stool / bench that I found. I have a confession to make. I sit cross legged while I work on the computer. There, I said it. It's out there for everyone to know. I feel I need to tell you all this to explain why this foot stool is so amazing to me. This bench happens to be the exact height as my office chair. I get to sit with my legs out in front of me in a wide crossed legs awkward position. So I have this bench and you think wonderful Kari. Now what? Use it right? No! That sounds like what any sensible person would do, right? Did I say I was sensible? No. No I didn't. You might be asking yourself now what did this girl do. Well, I will tell you. I took this bench from alright to BAM! POW! CAPOW! I do apologizel I made a newbie blogger / DIYer's mistake. I forgot to take an initial photo of my bench. I know I know I'm horrible, but I will make up to you I promise. You can see from the picture that I did remember to take that the bench was super cute, when it was new. I could have left it as it was and just given it a little scrubbing, but I thought "No". I need to do this. 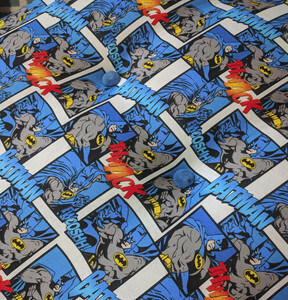 I have had this amazing Batman fabric in my closet for over a year now and I decided that it would be perfect for my office (cool comic book style batman not cartoon Batman). So jumping into the project. I started by removing the legs off the stool and taking them outside to paint. I originally wanted to paint the legs black, but I didn't have enough for the job. I did remarkable have a blue that was the exact color of the fabric. Imagine that. huh. Second cam removing the fabric. The demolition portion of any project is honestly the most satisfying job especially when you are putting holes into walls. With that being said I worked up a serious sweat tearing apart this bad boy. The buttons that were fastened to the bench were difficult to remove. These were some serious two inch nails sunk into the sides. However; I was very happy to find that the buttons that came from the top of the cushion were in perfect condition. I knew that I was going to want to reuse them somehow. 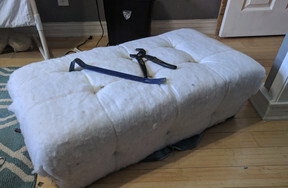 "evil laugh took place in my head at this point"
Once all the buttons and bits were removed from the cushion I headed out to the garage to start stapling the fabric on. This project was meant to happen. First the paint I have is the perfect shade of blue, and second the fabric is perfect width for the stool. 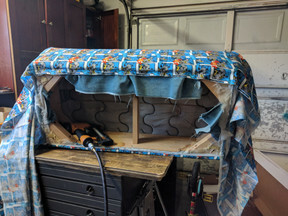 I started on one of the long sides stapling the fabric down along the edge. 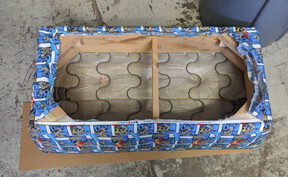 I pulled the fabric over the stool at this point and pulled the material smooth. Starting in the center I started stapling the edge moving inch by inch stapling as I went. Making sure to pull the fabric nice and tight. 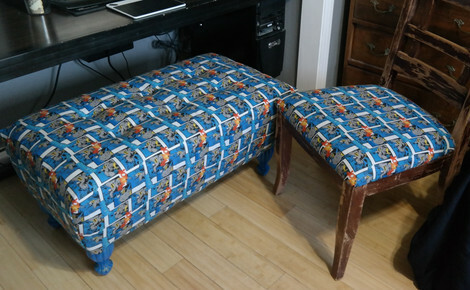 You can see the result after stapling the two longer sides of the cushion. It was at this point I was feeling really excited about the outcome. These are always fun. So I folded the fabric in towards the center and pulled flat. I wanted the fold line of the fabric to run parallel to the corner edge down to the ground. Buttons. I told you I wanted to use them again. Well I decided to use the same spray paint and gave them a good coating. So as I was painting the buttons all I could think is this blue is horrible. This isn't going to work. Ha. Turns out the blue was perfect. 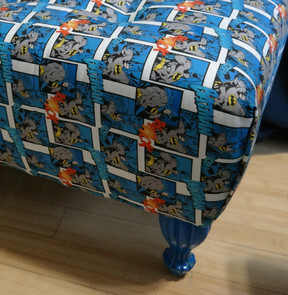 The buttons took the look of the foot stool to the next level and made me fall in love with them. As you can see the buttons look AH-MAZ-ZA-ZING. After reassembling the buttons and the legs on the stool I turned it over and felt so much excitement. So much so that I decided that I needed my office chair to match! HAHA yes I took off the seat base and covered it too so office furniture would all match. I can safely say that I'm feeling pretty darn good about my nerd status right about now. So I leave you now with this thought. What do you have that you are filled with so much love for because of its nerdiness?